Riga Technical University (RTU) is an accredited, internationally recognized European level university offering high-class academic and professional study programs with about 17 000 students. The graduates of our RTU are many prominent specialists, high-class professionals and researchers. Our principal goal is to provide the Latvian national economy with qualified human resources for its stable growth and development. We work with our students sharing our knowledge, skills and experience as well as try to communicate to them also the spirit of zealous search for the new – the spirit of investigation, the desire to stretch their minds, invent and innovate. 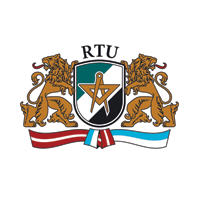 RTU is the only many-branched technical university in Latvia. Now there are more than 17 000 students, including 400 Doctoral degree students, 3200 Master’s degree students, 10000 Bachelor’s degree students, 1400 Academic personnel. RTU has expertise in application of formal methods for safety and performance evaluation, development of software and functional prototypes for onboard electronics and embedded control and safety systems for railway transport domain. Research fields: intelligent transport systems, evolutionary algorithms for embedded systems, genetic programming for embedded systems, energy saving multifunctional power electronic converters, performance optimization services for electric drives, diagnostics of group traction drives and vibration of locomotives, standard development in railway transport. RTU is involved in the desing and development of specialized projects for transport systems and its’ optimal control, i.e. maximization of energy efficiency, capacity and safety and minimization of exploitation costs using high technologies. High technologies in railway transport include new intelligent electronics devices for solution of different transport and energetics tasks, using the most modern technologies and methods, such as artificial intelligence, wireless technologies, robotics, safety and security technologies, sensors, detectors, electronic analyzers, monitoring systems and satellite technologies. LV 14354 B Automated user request identification system for microclimate control. Beinarts I., Ļevčenkovs A., Ribickis L. 2011. Riga Technical University. Developed devices are easily integrated in existing infrastructure, functioning in united network with wireless communication, they are flexible, modular and re-programmable that allow fast and easy extending of functionality by user request for the solution of other tasks and adapt them to requirements and standards of different countries. Gorobetz, A.Levchenkov, A.Potapovs. Adaptive Algorithm of Active Railway Safety System for Smooth and Precise Braking //In Proceedings of 24rd International Symposium on Vehicle Dynamics on Roads and Tracks, Graz, Austria, 2015 – 40.3 – ID243, 1-9 pp. Levchenkov, M.Gorobetz. Algorithm for Multiple Criteria Decision Making in Clash Prevention at Railway Stations // In Proceedings of 23nd International Conference Multiple Criteria Decision Making, Germany, Hamburg, 2015. Levchenkov, M. Gorobetz. Control Algorithms for Mircoprocessors-based Unmanned Aerial Vehicles for Latvian Railways //In Proceedings of the 9th International Conference Rolling Stock XXI, Russia, St.Petersburg, 1-5 July 2015. Levchenkov, M. Gorobetz. Field tests and certification of innovative equipment of wagons for Latvian Raiways //In Proceedings of the 8th International Conference Rolling Stock XXI, Russia, St.Petersburg, 25-28 June 2014. Levchenkov, M.Gorobetz. Evolutionary Algorithm for Reducing Railway Accidents Caused by Human Factor //In Proceedings of the 2nd International Conference RAILWAYS 2014, France, Ajaccio, 7-11 April 2014. Levchenkov, M. Gorobetz. Wireless Braking Control System for Railway Transport. //In Proceedings of 23rd International Symposium on Vehicle Dynamics on Roads and Tracks, Qingdao, China, 2013 – 43.7 – ID520, 1-9 pp. Potapovs A., Gorobetz M., Levchenkov A., Mathematical modelling of smooth and precise adaptive train braking system // In Proceedings of International Conference SIMULTECH 2013, Rejkyavik, Iceland – 2013, 1-4 pp. Gorobetz. Decision Making using Immune algorithm for Increasing of Level Crossing Capacity // In Proceedings of 22nd International Conference Multiple Criteria Decision Making, Malaga, Spain, 2013 – 1 p.
М.Gorobetz, А.Levchenkov, L. Ribickis, P. Balckars „Generating of Multi-Criteria Alternatives for Decision-Making in Electric Light Rail Control” //In China-USA Business review, December 2009, 49-55 pp. Levchenkov A., Gorobetz M., Ribickis L., Balckars P. Generating of Multi-Criteria Alternatives for Decision-Making in Electric Light Rail Control. //In Proceedings of 20th International Conference on Multiple Criteria Decion-Making, 2009, Chengdu, China. (2010) Testing of new motion control device of rolling stock in emergency situations, Nr. FLPP-2010/32, in collaboration with SJSC “Latvian Railways”. (2009-2010) Development and simulation of optimal control genetic algorithm for rail transport. ZP-2009/36, in collaboration with SJSC “Latvian Railways”. (2011) Development of intelligent level-crossing safety device and algorithmDzelzceļa pārbrauktuvju intelektuālo drošības iekārtu un algoritmu izstrāde. Nr. FLPP-2011/14, in collaboration with SJSC “Latvian Railways”. (2010) Testing of new diagnostics device of rolling stock in emergency. FLPP-2010/34, in collaboration with SJSC “Latvian Railways”. (2009-2010) Modelling of intelligent rail transport control in unforeseen situations using immune algorithms ZP-2009/35, in collaboration with SJSC “Latvian Railways”.